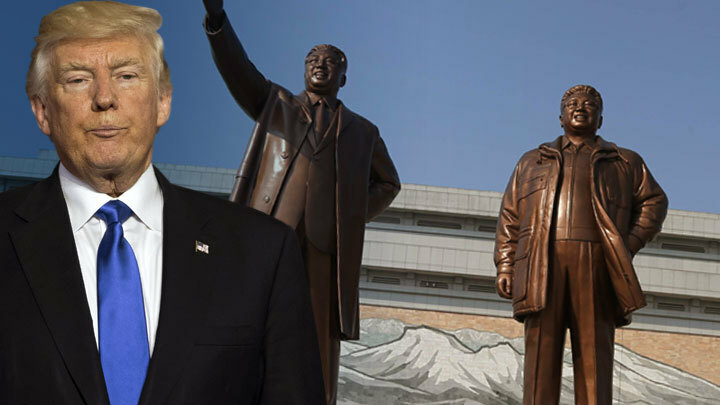 Home » Will Trump turn DPRK into an “economic rocket”? On February 27, negotiations between Donald Trump and Kim Jong-un will take place. Will the leaders of the United States and the DPRK be able to reach real agreements, or will the summit in Hanoi be no more than another Trump show? All is ready. The capital of Vietnam stood in anticipation of the second historic meeting of the American president with the North Korean "dictator". American journalists will closely monitor all the details of the summit. Will Trump approach Kim Jong-un first or will everything happen in sync? Or maybe the president of the United States will keep himself waiting in the conference hall of the Metropol hotel? It is also important whether someone is deliberately late, showing by this that he is the host of the summit. Whether Kim Trump is usually serious and callous, he smiles and how he will shake hands with his partner. These are details that have yet to be found out. Meanwhile, journalists are actively discussing the arrival of Kim Jong-un. This morning, having traveled half of Asia on his armored train and spent 66 hours on this business, the North Korean leader crossed the Vietnamese-Chinese border. At the border station Dongdan he was greeted by a red carpet and a guard of honor. Under the hum of cheering Vietnamese, Kim moved into an armored limousine and, accompanied by 30 cars, moved to Hanoi. Although now in social networks and the media are making fun of Kim's huge tuple, his vis-a-vis modesty is no different. There are lots of videos on the Internet where you can get lost with counting the cars that accompany the head of the White House. Journalists from the United States "sniffed out" what hotel the head of the DPRK would be in and settled there in advance. However, shortly before the arrival of the “world leader of the 21st century”, the organizers expelled the Americans. The twins of the two politicians made a noise. With the double Kim Jong Un from Hong Kong, there was no particular ceremony and they expelled him from Vietnam. His friend, a Canadian who looked like Trump, was more fortunate — he was simply asked to dress differently than the president of the United States. Details and trivia about the summit, the world media will discuss for a long time. But will they be supported by some specific agreements? Donald Trump and Kim Jong-un are lovers of scattering loud phrases, both menacing and pacifist. But, unlike the June meeting in neighboring Singapore, this time it will be difficult for them to announce their “victory” and progress. What is needed is not mythic promises, but real agreements. Hanoi for visitors has already advertised as "a city of peace and prosperity." Trump and Kim need to make great efforts to ensure that the capital of Vietnam does not remain in memory as a "city of frustration". On their first “date,” the politicians agreed on four intentions. First, the United States and the DPRK pledged to establish diplomatic relations. Secondly, they promised to “make efforts” to establish a sustainable and lasting peace on the Korean Peninsula. Third, Trump and Kim announced their readiness to achieve the denuclearization of the Korean Peninsula. And, in the last, pledged to return the remains of prisoners of war and missing persons. Trump and Kim's meeting is scheduled for the second half of Wednesday, February 27. At first they will talk face-to-face in the presence of translators and two advisers, then a joint dinner will be held. The substantive part of the summit will be held on February 28, at which it is planned to sign a joint declaration. Optimists expect that two politicians chasing glory will manage to realize one of the following points. First of all, they talk about the normalization of American-North Korean relations: the signing of a peace treaty and the establishment of diplomatic relations. Another important issue, especially for the DPRK, is the lifting, possibly partial, of international sanctions. The North Korean economy, with the support of the PRC, has become accustomed to living under economic pressure, but, according to some rumors, is about to “tilt”. Therefore, Kim needs their cancellation not only for his own glory, but also so that the throne does not swing beneath him. Perhaps the most important moment of the Trump-Kim negotiations is the nuclear disarmament of North Korea. In exchange for easing the sanctions, the DPRK may open part of its nuclear facilities to inspectors and begin the elimination of its missiles. But most probably, Trump and Kim's talks will end in nothing. Kim Jong-un will not abandon the nuclear program, because it is the only guarantee of preserving sovereignty. Trump will not lift the sanctions, because they were put under pressure from the American globalists opposing it. The North Korean direction in Trump’s foreign policy itself is more likely to dispel and distract attention from Syria and the Middle East as a whole, but formal statements and handshakes that imitate agreements are not excluded. It is obvious that, even imitating friendship, the two leaders are fully aware of the responsibility and limitations for making breakthrough decisions. Trump is holding back Congress, and Kim is afraid of repeating the fate of Gaddafi or Saddam Hussein. However, the understanding of this does not save politicians from the need to go to certain “cosmetic measures”. The head of the White House needs success outside to mitigate the blow from Special Prosecutor Muller’s investigations, and his North Korean “friend” to instill in his citizens the hope that Trump's intention to turn the DPRK into an “economic rocket” is not populism, but an approaching reality.